Home / Shop by Price / Purim Deluxe - Free Shipping! Purim Deluxe - Free Shipping! 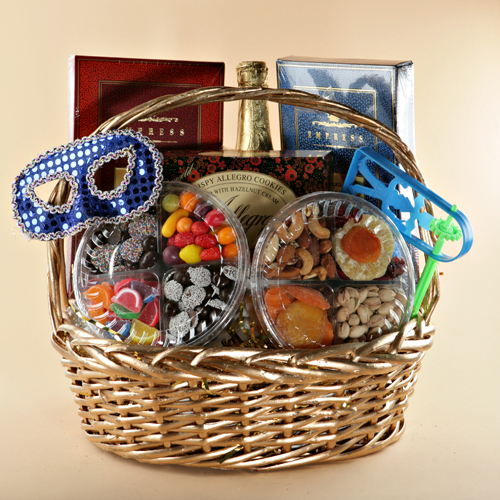 A fabulous Purim gift basket containing 2 gift boxes of gourmet truffles, 2 gift platters of premium nuts and dried fruits, dark chocolates and candies topped off with quenching juice and delicious cookies. Includes chocolate nonpareils, candy fruit slices, swiss petite mix candies, pistachios, mixed shelled nuts, pineapple, mango and apricots. Always fresh and delicious!